If you live in Minnesota, please be aware. The zoonotic disease (which means it’s spreadable to you and your family), tularemia, was just reported for the first time this year in Minnesota. It’s transmitted by the bacterium Francisella tularensis. If you notice any sick rabbits, stay away. This is definitely spread to cats, and can result in severe illness in outdoor cats. When in doubt, please seek veterinary attention immediately if you have a sick pet! More information below in the press release. On April 27th, 2016, the first case of tularemia this year in Minnesota was confirmed in a rabbit found in Hennepin County. An Edina resident found multiple dead rabbits outside their building within several weeks; two rabbits were submitted to the University of Minnesota Veterinary Diagnostics Laboratory (VDL) for necropsy. Tularemia was identified in one rabbit at the VDL, and was confirmed at the MDH Public Health Laboratory. Veterinarians in the metro area and throughout the state should be on alert for cases of tularemia in cats, dogs, rabbits, squirrels and other wild animals, and take appropriate precautions (such as wearing gloves) when handling suspect cases. Tularemia is a zoonotic disease caused by the bacterium Francisella tularensis. The most commonly affected wild animals in Minnesota are the cottontail rabbit and squirrels. Cats are the most commonly reported domestic animal, with zero to three cats reported annually. Clinical signs in cats include a high fever (104.5°F-106.9°F), lethargy, lymphadenopathy, and ulcerations of the tongue and palate. Tularemia has been confirmed in cats from rural, urban, and suburban environments. While outdoor animals that hunt are at highest risk, tularemia has been identified in indoor cats, with no obvious exposure. Dogs can be infected with F. tularensis, but are often asymptomatic or have mild disease. Diagnosis is confirmed by culture, PCR, and DFA of clinical specimens and serologically by a four-fold rise in titer. Every effort should be made to collect pre-treatment culture specimens from suspect cases. Please check with the Veterinary Diagnostic Laboratory (612-625-8787) prior to submitting animals for necropsy or clinical specimens for testing. 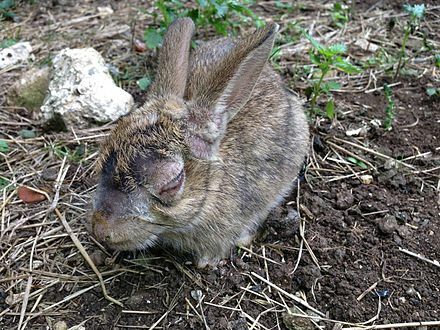 Humans can also acquire tularemia, through contact with infected animals or ticks and biting flies. It is not transmitted person-to-person. Zero to three cases are identified each year in Minnesota. The incubation period for tularemia in humans is generally 3-5 days (range, 1-14 days). Acute signs and symptoms include sudden onset of fever, chills, joint and muscle pain, headache and nausea, and lymphadenopathy. Please consult your healthcare provider and notify the MDH if you have recently cared for a suspect tularemia patient and have symptoms consistent with tularemia. For more information, or to report suspect cases, please call the Minnesota Department of Health (651-201-5414) or the Minnesota Board of Animal Health (651-296-2942). We have a place in Wabasha Minnesota since November we have had 6 dead squirrels in our yard most where around our bird feeder. We have one in our yard now should we have it tested to see what is killing them. We have dogs and are concerned that this may spread to them. Please let me know what we should do. I would consider bringing a deceased squirrel to the Veterinary Diagnostic Lab at UMINN – they can potentially do testing!